Shark's Cove Snorkeling Rental Prices 2017 :: north shore snorkeling. oahu hawaii. Shark’s Cove Snorkeling Rental Prices 2017 :: north shore snorkeling. oahu hawaii. 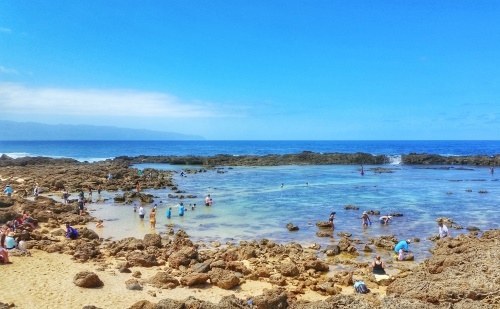 Shark’s Cove is a top snorkeling destination in Hawaii. It’s one of the most famous snorkeling spots on the North Shore of Oahu. So, can you rent snorkeling gear at Shark’s Cove? Yes, there is a place just nearby to do so! If you’ll be staying on the North shore for more than a day, there are also 5-day rentals and weekly rentals available. This personal buoy or this snorkel vest so your family on the beach can spot you out in the water in an instant! This shirt with UV protection to wear so you don’t burn under the strong tropical sun rays when you’re in the water! If you’re on a desktop, you can filter out who you’re looking for, otherwise, type in women, men, girls, or boys! These types of beach shoes if you’re not wearing fins so you can protect your feet from sharp rocks hidden under the sand! For a more in-depth look, have a look to what to wear snorkeling! Because it’s an enclosed lagoon, Shark’s Cove is a top snorkeling destination on Oahu’s North Shore, especially during summer months. Shark’s Cove is located in one of the Hawaii Marine Life Conservation Districts. There are these Marine Life Conservation Districts on 3 of the Hawaiian islands: Oahu, Maui, and Hawaii island (the Big Island). And there are 3 conservation districts on Oahu. Shark’s Cove is located in the Pupukea district, and you can find the other 2 at Hanauma Bay and Waikiki. Shark’s Cove is protected as a marine life conservation district because you can see lots of marine life, which is part of what makes it a popular Oahu snorkeling beach on the North Shore! Which is probably why you may want to consider making Shark’s Cove a part of your Hawaii vacation! And, you may also consider whether you want to bring your own snorkeling gear to Oahu from home, or to rent snorkeling gear when you arrive. BUT, you may also be thinking it would be quite helpful to know how much snorkeling gear rental costs at Shark’s Cove! 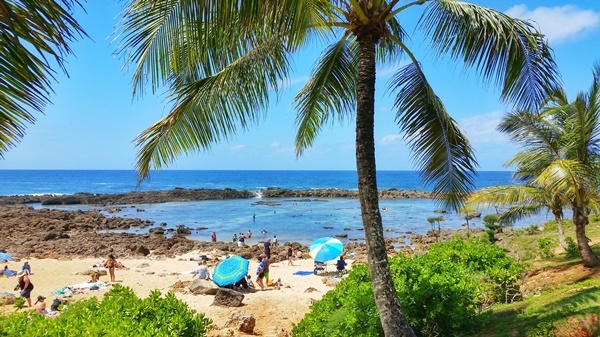 Because if the only time you’ll be snorkeling when you’re in Hawaii is when you visit Shark’s Cove, you might find it better to rent snorkeling gear on the North Shore. 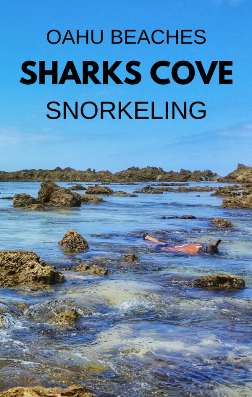 Where can you rent snorkeling gear at Shark’s Cove? There’s a place to rent snorkeling gear right across the street from Shark’s Cove. It’s in the same area you’ll find bike rentals on the North Shore, as well as some of those North Shore food trucks you may have heard about! What are the Shark’s Cove snorkeling rental prices? You actually have 3 ways you can rent snorkeling gear. You can rent it at a daily rate, you can rent it for 5 days, or you can rent it at a weekly rate. What snorkeling gear do you want to rent? One option you have is to rent a full snorkeling set with the mask, snorkel (the part that lets you breathe), and fins. The other option is to rent just the fins. Why is there an option to rent just the fins? As a visitor to Oahu, probably the most convenient reason is because fins can take up a lot of space in your luggage. The mask and snorkel really don’t take up much space. So if you buy a snorkeling set with just the mask and snorkel like this one, you can finish off your set by renting at Shark’s Cove without your snorkeling gear taking up a ton of room in your luggage. Do you need fins at all? Even if you’re a confident swimmer, fins will help you go further more easily. This means that they will help you to conserve energy, which means that you can snorkel longer without tiring as quickly! If you choose not to wear fins, it would be a VERY good idea to have water shoes like these! Shark’s Cove is a rocky beach entrance, and those rocks are in the water as well. There are lots of hidden rocks under the sand too, whether it’s on the beach or in the water. It will likely be a much more pleasant experience with water shoes. Keep in mind that these are prices as of spring 2017, and prices can change at any time. But this is a good approximation of how much you can expect to pay for renting snorkeling gear on the North Shore in front of Shark’s Cove. There is a lot to do on the North Shore, so if you want to create a jam-packed day, you’ll find activities to fill your whole day! The North Shore is a good area to see turtles in Oahu. You can also make a trip to a botanical garden, waterfalls, or an ancient Hawaiian temple, all things to do near Waimea Beach on the North Shore. Otherwise, if you’re looking to choose just 1-2 beaches to fill up your day, the North Shore is a good choice too. Use the Oahu vacation planning guide here! 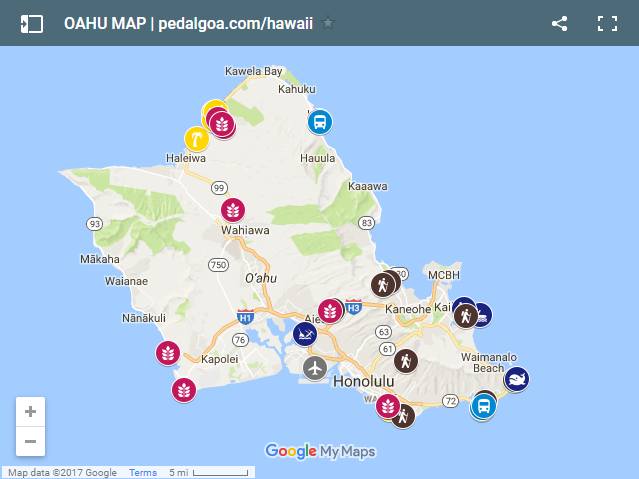 There’s an interactive Oahu map, so zoom in to the North Shore, and you’ll find nearby activities.